Just to show you all what a man I am, I ate a fish taco tonight. We kept seeing signs for them everywhere and laughing about it. Maybe that doesn't sound weird to you, but having lived on the East Coast all my life I had never even guessed that such a thing would exist. The verdict: not bad! The strangest thing about it was that it had coleslaw on it. I don't normally eat coleslaw as it is, so yes, this was truly a brave thing that I did tonight! I think I gather you are from the LA/so cal area. If you want a good fish taco, make your way to Wahoo's Fish Tacos. SOOOOOOOO MUCH better than Rubio's. 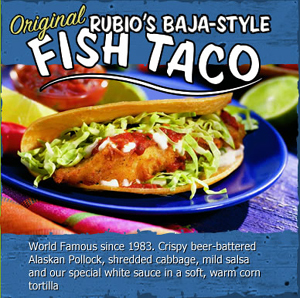 Rubio's will taste like cardboard when you've had a Wahoo's taco. Also if your in So cal, we'd love to see you at one of our Emergent Cohort meetings. Not sure I want to repeat the experience just yet, but I'll keep that in mind! Thanks for the invite, though. I didn't realize there was a cohort around here. I'll be talking to you more about it. Hey Bill, you have to get down to the Baja to get REAl fish tacos. My wife and I lived there for four years and just about every visitor of our was totally appaled at the thought of fish tacos until they ate one. I guess most people don't realize they are battered. And yeah the usual toppings are cabbage, guacamole, mayo, salso and limon. Then you can get adventurous with the shrimp tacos.. And have you eaten at "the Hat" yet in Pasadena? World famous pastrami sandwiches. I really miss that place..